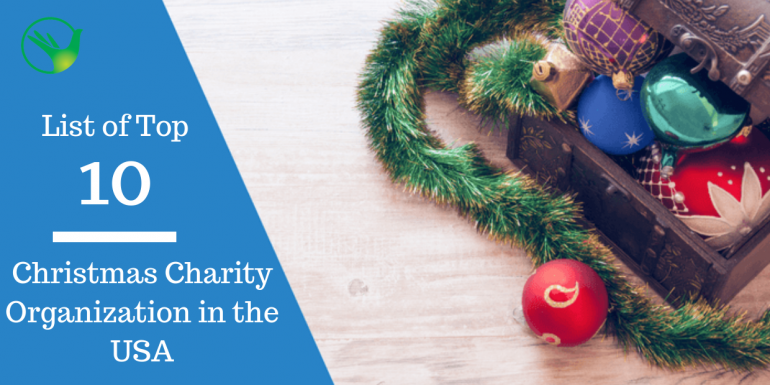 Online Charity organizations are changing lives through their crowdfunding method. 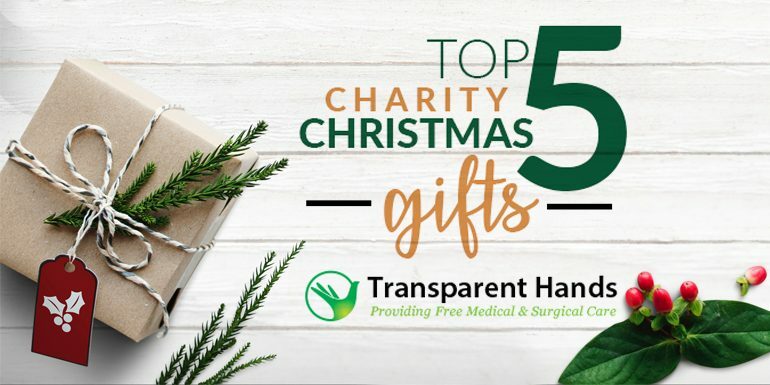 They are raising funds from donors online and helping to save millions of lives every day. These funds are gathered and spent for numerous causes: to provide a safe shelter to the homeless people, to provide free diagnosis, treatment, medicines and surgeries for poor patients, to rescue and protect animals from all kinds of abuse and tortures and what not. The beauty of Christmas engulfs our heart and mind like no other season, because it is the time when our soul is molded in the spark of delight and divinity.Unfortunately, only a few people can enjoy Christmas, because they have the luxury and wealth to do so. Life in a low-income family is almost like a war. It is a war against your financial instability, a war against your odd circumstances and probably a war against your misfortune. You hope that one day your hard work will bear fruits and you will be able to overcome this miserable situation but every evening you return home tired and exhausted with nothing in hands. You would feel like screaming out loud to vent out all your inner frustrations and want a break from your struggles but you know you cannot back out. Christmas celebrations give us the opportunity to steal away some time from our busy schedules and leave us the room to enjoy the goodness of life. Amidst all the candles, lights, tinkling bells and grandeur feasts, there is a duty we must not forget - our duty in the form of servitude towards humanity. We are blessed to have started off life on an easy and convenient track. Probably none of us had ever been in a situation when we had little money in hand and had to pay for our numerous needs like paying the house rents, bills and tuition fees, buying foods and groceries and so on. Christmas uplifts the spirit of love and goodness and it is the time to look beyond our busy lives and become more interested in people than in materialistic stuff. When you are leading a comfortable and cozy life having everything at your disposal it is normal to forget the underprivileged people struggling hard each day just to ensure that they don’t get wiped out from this world. Christmas becomes delightful when we are wrapped with the warmth and love of our family at the comfort of our home. Unfortunately, we live in an unequal world where life is easier for those who have the wealth to buy the comfort whereas it becomes a nightmare for the people who do not have the luxury to pay for their basic necessities. When we are being blessed with the fortune and goodness of life, we must warm up our conscious on this spiritual and festive eve of the Christmas and think about the people that aren’t as fortunate as us. Monica Stewart is a full-time worker at a daycare center in Birmingham, Ala. She is a single mother and earns a minimum wage. She lives in a small one bedroom apartment with her 9-year-old daughter Katherine and 7-year-old son Samuel. She struggles hard each day to manage her daily expenses within her limited salary. Being a single mother, she has to worry a lot about fulfilling her kids’ basic needs such as food, clothing, healthcare, and educational expenses. She often chooses cheap foods instead of healthy ones to make sure there are three times meals available to her kids. 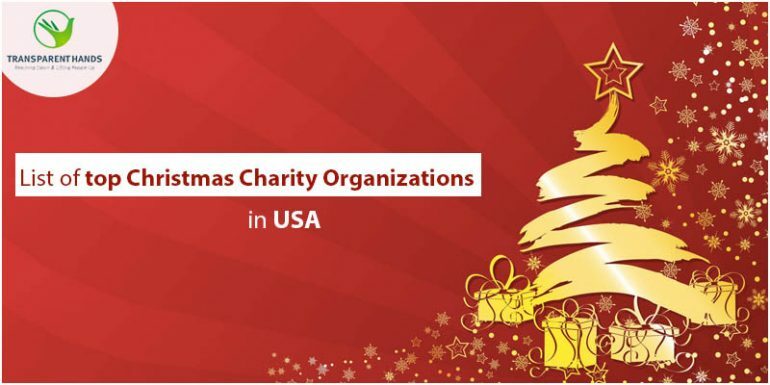 List of Top 15 Christmas Charity Organizations in USA. 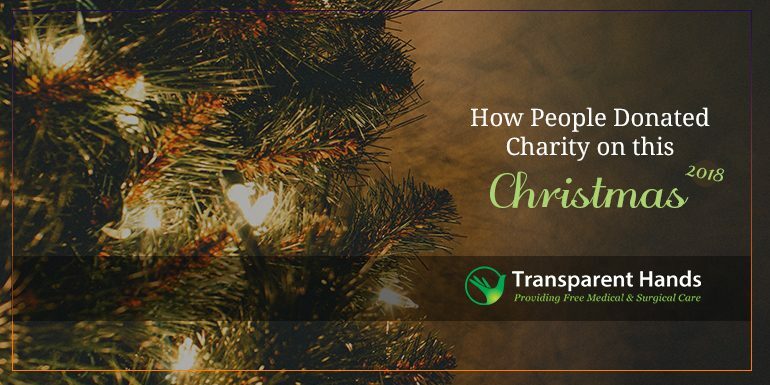 The way to spreading Christmas cheer is by giving as happiness multiples when we share kindness in words to create confidence in the fallen lives. It is only what we do for others counts in life. It is only what we do for others is immortal and remains in the world. 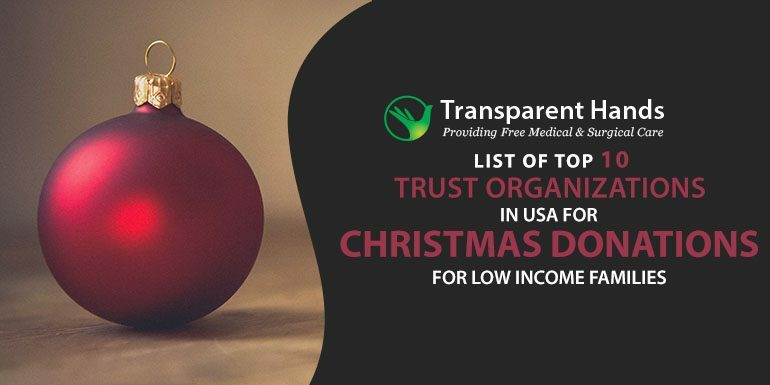 List of Top 15 Trust Organizations in USA for Christmas Donations for low income Families. 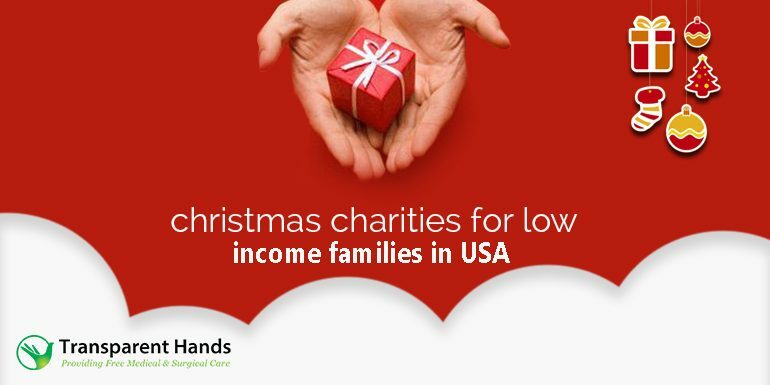 There are some low-income families in the neighborhood for whom the joy of Christmas has faded away. Perhaps they haven’t eaten for days; perhaps they don’t have adequate clothes or other utilities and suffering every minute because they live in an uncaring and cold world! A world where no one cares. 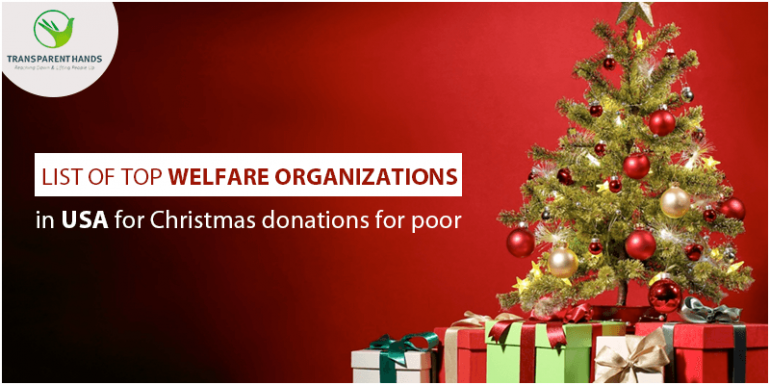 List of Top 15 Welfare Organizations in USA for Christmas Donations for Poor. Welfare organizations have set out on the sacred mission to reduce poverty through effective research, execution of practical policies and programs, looking for innovative ways often by training people to lift up themselves from poverty and menace as the long-term solution. We need to strengthen the hands of these welfare organizations so that they can bring the change they believe they can create.